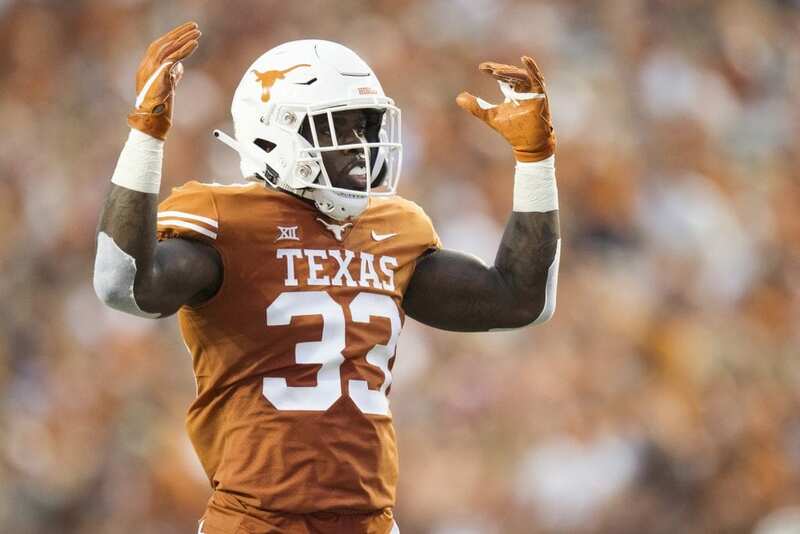 Texas linebacker Gary Johnson understands the calling and the expectations that go with football in the Southeastern Conference – even if he never played for a team that’s part of the league perceived to be the class of the college game. Johnson, who was born in Atlanta and raised in Alabama, will end his college career on Tuesday lining up against Georgia in the Allstate Sugar Bowl in New Orleans, trying to beat one of the SEC’s top programs. That battle will carry special meaning for Johnson, and not only because his final collegiate opponent comes from his home state. “Playing against an SEC team and in the Superdome and in the Sugar Bowl was something I always thought I would do when I was growing up, so this game carries a lot of weight for me and for my family,” Johnson said in the run up to Tuesday’s game. Johnson dreamed of playing for the Bulldogs when he was a boy, then thought he was going to strap it up for Alabama after being recruited by the Tide as three-sport star in high school in Douglas, some two hours northeast of Tuscaloosa. Instead – after a circuitous path that included two years of junior college football in Kansas, a protracted re-recruiting process that saw some of the nation’s top teams clamoring for his services for his junior and senior years, and two standout campaigns on the Forty Acres – Johnson will be looking to make a final impression on NFL scouts against a team from the league he once thought he would dominate in. Johnson’s next-to-last college contest, the Longhorns’ loss to College Football Playoff-bound Oklahoma in the Big 12 Championship game on Dec. 1, was one of the best of his career. He amassed 11 tackles, tying his career high, with 1½ of those for a loss and a forced fumble against the Sooners. That forced fumble came after a 40-yard chase that kept OU from scoring and momentarily turned the tide. in 25 career games with 19 starts. And that award was garnered even though Johnson missed the second half of Texas’ season-opening loss at Maryland and the first half of the ensuing win over Tulsa because of a targeting penalty and was held from the Longhorns’ regular-season-ending win at Kansas because of a violation of team rules. He leads Texas with 85 tackles, 15 ½ of them for a loss, with five and a half sacks, a pass breakup, eight quarterback hurries and two forced fumbles. Johnson, who famously won the 2015 Alabama Class 5A state title in the 100-meter dash as a senior in high school with a time of 10.59 despite eschewing the use of starting block, makes his mark with his speed and finishing prowess, and will be a huge factor in controlling the Georgia running game. Texas safety Brandon Jones said this week that the 6-foot, 230-pound Johnson might be the hardest-hitting member of a physical defense. While Texas is double-digit underdog in the Sugar Bowl, Johnson dispels the notion that the Big 12 can’t hang with the bigger, tougher SEC. If anyone should know it’s the guy who’s been around many of the players he will line up against. The last time Texas played against an SEC team, Johnson led the Longhorns with 10 tackles, including a pass breakup and a quarterback hurry, in last season’s 33-16 Texas Bowl win over Missouri. When the dust clears on Tuesday night at the Superdome, Johnson can look ahead to a career at the next level and a good life that will include the birth of a daughter in January. He already has a young son.